Children are miraculous! They are born with an innate knowledge of language. BUT children are not born with an innate knowledge of reading. They need to be taught that text is read from left to right and that words are separate from images. Although learning to talk and read are two distinct domains, they are also intricately related. 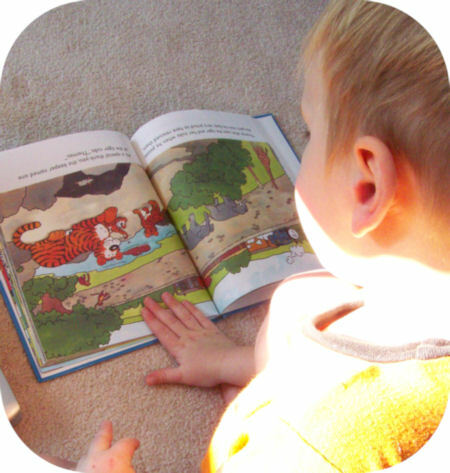 Early language skills are linked to later successful reading. Young children need a variety of skills to become successful readers. Research indicates that children who enter school with more of these skills are better able to benefit from the reading instruction they receive when they arrive at school. The following core skills have been identified as being crucial to the development of later reading. Knowing the names of things is an extremely important skill for children to have when they are learning to read. Help develop your child’s vocabulary by reading a variety of books (both fiction and nonfiction), and by naming all the objects in your child’s world. Print motivation is a child’s interest in and enjoyment of books. A child with print motivation enjoys being read to, plays with books, pretends to write and asks to be read to. • Shared book reading a special time, keeping books accessible, and letting your child see that you enjoy reading. • Explain how reading and writing are used in everyday life, for example shopping lists, newspapers, TV guides, and computer screens. A fun activity is to read through the TV guide with your child and bookmark a favourite programme to watch or record. Print Awareness includes learning that writing in English follows basic rules such as flowing from top-to- bottom and left-to-right, and that the print on the page is what is being read by someone who knows how to read. An example of print awareness is a child’s ability to point to the words on the page of a book. Pointing out and reading words everywhere you see them – on signs, labels and the supermarket. Going shopping with young children. This can be challenging, especially with all the sweet temptations within the child’s direct line of sight. I know that it is easier to leave your child at home when you go shopping, but try to make a point of taking your child with you at least once a week. 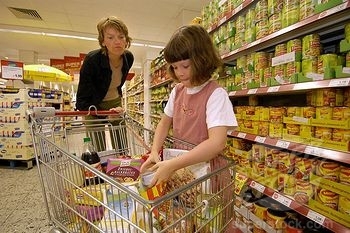 Something to keep your child occupied in the supermarket is to send him ahead of you in the aisle to try to find a certain brand of crisps/cereal/tomato sauce. Drawing your child’s attention to prices also creates print awareness. The ability to understand and tell stories and describe things is important for children in order to understand what they are learning to read. An example of a narrative skill is a child’s ability to tell what has happened at a birthday party, or a class outing. Asking him to retell a well-known story. Encourage your child to predict what might happen next in the story. Facial expression can create excitement about what might happen. Encourage your child to tell you about things he has done that have a regular sequence to them. For example, having a bath. Letter Knowledge includes learning that letters have names and are different from each other, and that specific sounds go with specific letters. An example of letter knowledge is a child’s ability to know that the letter B makes a /b/ sound. Playing games like “I spy” will develop phonemic (sound) awareness. Focus your child’s attention on the letters in the words and highlight the letters that are in your child’s name. Encourage your child to pay attention to the shape of letters and trace them with his finger. Phonological Awareness is the ability to hear and manipulate the smaller sounds in words. Phonological awareness includes the ability to hear and create rhymes, to say words with sounds or chunks left out, e.g. monkey without /mon/, and the ability to put sounds together to make a word. Exposing your child to songs and rhymes. The environment and daily routines in your home can be one of the best teaching tools to help children develop pre-reading skills. A print-rich environment helps foster skills needed for reading. By surrounding your children with print in your home and talking to them about what it means, they will learn more every day. As your child points, labels, makes nonsense words, and tells you outrageous stories, they are practicing to be literate. The next time you hear the word “again p-l-e-a-s-e!” remind yourself that you are laying the foundation for life-long literacy. So with the same enthusiasm you’ve demonstrated one hundred times before, “READ IT AGAIN” as if it were the very first time! When is a lisp no longer cute?